Sacabambaspis. Sandbian (Late Ordovician) of south east Gondwanaland. Length 25 cm. 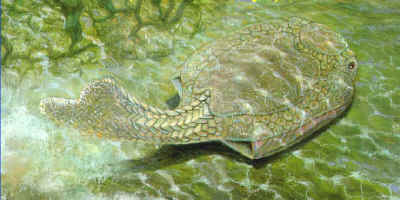 The Pteraspidomorphi include the earliest vertebrates (other than conodonts) known from reasonably good remains. These Middle or Late Ordovician forms include the arandaspids of the the Gondwanan continents of South America and Australia and the astraspids of North America and the Siberian platform. Pteraspidomorphi: Loosely synonymous with "Diplorhina". Probably defined as Anatolepis + Psammolepis. Range: Early Ordovician or Furongian) to Late Devonian. Vertebrata ::: "Thelodontia" + * : Anatolepis + (Arandaspida + Heterostracomorphi). 10-200 cm; head very long (40-50% body length); paired nasal capsules, and ?openings; solid anterior plates, with at least a major oblong median dorsal and ventral plates and usually a median rostral plate above mouth; rostra and cornua common; pineal opening (psammosteids? ); brain with two semicircular canals; some show internal impressions of arcualia on notochord; body tends to be ventrally flattened (numerous exceptions); mobile tail, generally fan- or pad-like; tail hypocercal; no paired appendages; no unpaired fins except caudal; sensory line system present; no cellular bone (but see [H73]); possible traces of calcified cartilage in in some basal lineages; trilaminate aspidine; grebeshki ornamentation on dermal plates (lost independently several times); largely marine nearshore. Links: Pteraspidomorphi; Pteraspidomorphi; Gagnier; Pteraspidomorphi; Faktaside om lungefisk (Norwegian); Class Pterapisdomorphi; Life of the Ordovician; Paleozoic Fossils UK (extraordinary images on this site!). References: Halstead (1973) [H73]. APW040316. Furongian to Early Ordovician of North America, Greenland & Spitzbergen. 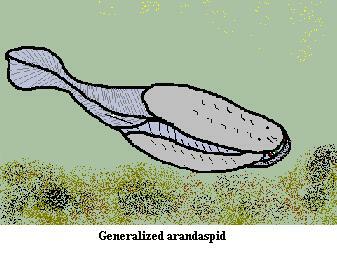 Pteraspidomorphi : Arandaspida + Heterostracomorphi) + *. Known from fragments only. Apatite with scale-like ornamentation; dentine odontodes with pulp cavity; dentine covered by another mineralized tissue of unknown homology; "exclusively tropical, circum-Laurentian, distribution, where it is restricted to outer shelf settings". Notes:  It seems I am not the only one who writes haiku about early chordates: see University of Alberta Palaeontological Society Website. Arandaspida: Arandaspis, Sacabambaspis, possibly Porophoraspis. Medium-sized (12-14 cm) very primitive, teardrop-shaped marine fishes. Range: Early to Late Ordovician of Australia & South America. Pteraspidomorphi :: Heterostracomorphi + *. Two large, thin (<1 mm) plates on head (dorsal & ventral); ventral plate convex, dorsal plate flattened; main plates ornamented by drop-shaped or lobate tubercles; eyes in extreme anterior; solid sclerotic ring present; nostrils (?) just medial to orbits on embayment in anterior surface just dorsal to mouth; mouth lined ventrally with numerous small scales; possible lingual or velar apparatus; paired pineal (2?) and parapineal (4?) openings on anterior of dorsal plate (which may be endolymphatic ducts instead); probably at least ten gill slits with smaller plates on sides; posterior body & tail may have been laterally compressed; body scales highly elongated and arranged in large chevrons (pointing anteriorly) on each side; no ridge scales; no paired or unpaired fins except caudal (poorly known); caudal fin probably pad-shaped and diphycercal; well-developed small lateral lines on both plates and medioventral surfaces; little or no endoskeleton; scales and plates trilaminar, with basal laminar layer, cancellous central layer (with double walls) and aspidine or cellular bone tubercles. No growth or fusion of scales. Links: Fischmarkt Bremerhaven (German); Class Pterapisdomorphi; New Page 1 large image of arandaspid fragment); Boletín de Publicación mensual de Spanish translation of a National Geographic article on Sacabambaspis); life-5-b-Xystridura exemplary short, encyclopedia-like entry with image of Sacabambaspis); Gli Agnati Italian). Pteraspidomorphi:: Arandaspida + *: Astraspidae + Heterostraci. Astraspis. Sandbian Late Ordovician) of Laurentia. Range: Middle to Late Ordovician of North America & Siberia. Heterostracomorphi : Heterostraci + *. Characters: Head armor massive; plates grew from multiple centers tesserae) which fused at maximum growth; eyes lateral; multiple (8-10) gill openings; dorsal shield ribbed with strong longitudinal crests; tail covered with large, diamond-shaped scales; sensory-line system with grooves in dermal plates; globular calcified cartilage present, probably(?) forming endoskeleton; tesserae with large mushroom-shaped dentine tubercles with pulp cavity; dentine covered with enameloid cap; trilaminar bone.